Storelli believes everything they design must perform at the highest levels in order to earn the trust of the best athletes on the planet. This commitment requires meticulous craftsmanship, perfect construction and materials, passion, pride, and gorgeous design that is tested and evaluated in every condition. Ultimately, their reputation for design is judged by the success of our athletes wearing Storelli gear. Does it give them the confidence to play their game without the fear of getting injured? To Storelli, the answer must always be yes because fearless players almost always win. 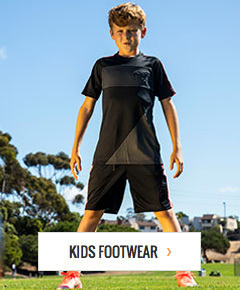 soccerloco is your source for Storelli protective soccer gear. From goalkeeper gear, to compression shorts, shirts and headgear for field players, we've got it all at the best prices with low flat rate shipping and easy returns. Shop soccerloco now and protect yourself on the field with Storelli gear.